Wow that looks amazing. Very well written script too. Junction VFX is the name of the effects company that put it together. If you have any questions or comments leave them below, and Ken from JunctionVFX will address them. Good notice! The tags for Sheppard didn’t arrive in time for the shoot date so as always it’s up to VFX to fix things. We tracked the shot and replaced the tags. If you visit our website you can see a VFX breakdown that shows you that particular scene. Oops thanks. That was my bad. He never claimed it was “real”. I just was dumb enough to assume it was because it looks so good. I updated the post and the title. either way, I am sure I am not the only guy that wants to run “The Pit” in real life. IT is BS… they tried to post it on Steam and on a few COD sites but it is BS the website http://www.findmakarov.com is also fake as it links back to a protected WHOIS search but further intel points to the site registry being based in Toronto. Many of us are gamers as well as fellow gun owners and soldiers in real life.. trust me this is fake! Thanks Punish3r. I don’t follow video games that closely, and it looked “real” to me. I updated the post and the title. No Problem btw I’ve been a longtime fan of this site.. I check it daily! Keep up the good work bro! That video was awesome. Brings back memories of many hours “wasted” playing MW2. Ehh whatevs. The MW series lost most of the serious gamers after the MW2 debacle. Besides, who buys a FPS for the single player campaign? It’s all about multi-player and in that aspect, Battlefield has been wiping the floor with MW. Who buys an FPS for the single player campaign? A lot of people, actually. For example, I really loved the story of the first Modern Warfare. I rented the second one for the story alone and was sorely disappointed. I know a lot of people are huge fans of the Halo storyline, as well. Not everybody likes multiplayer, and the insistence on putting so much effort into MP and little into SP annoys me. It was clear MW2 wasn’t made for it’s story, because the story had more holes than I could count. It was made pretty much exclusively for the MP, it seems. 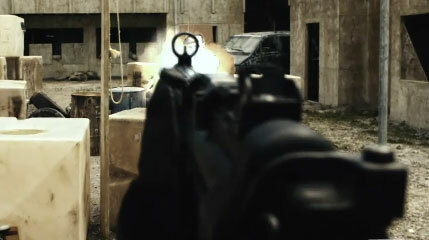 When they are shooting out of the Humvee i like how a bullet hole opens up in the top right of the screen, nice touch. Also at 1:00, the wall breach with holographic site head shot was a nice touch. Yes this is just a video made from some fans of Modern Warfare 2. We actually spent a ton of extra time on the breach shot. Its so often that the Holosight reticle is depicted incorrectly. While it’s still not perfect and not quite 100% how a real Eotech reacts, we’ve really tried to make it legit. We’ve even added the little light artifacts you see when looking at a laser. Subtle but its attention to detail. Infinity Ward we miss you!!!!! Agreed but I’m still waiting on a game that lets you kill someone with a single bullet to the head and not take a whole mag to the chest to drop someone.